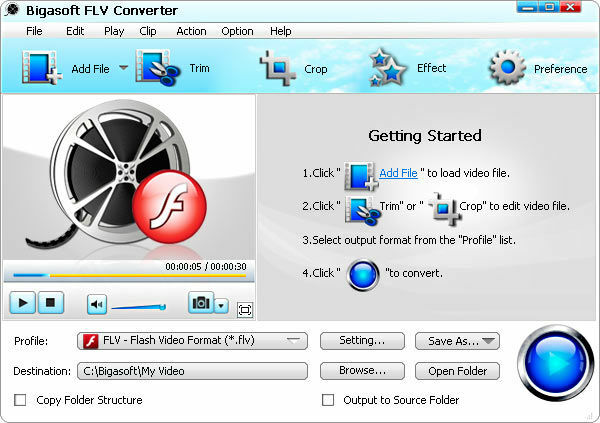 Bigasoft FLV Converter is a great way to help you easily convert FLV and online videos like YouTube video, MySpace and so on to any popular video formats such as AVI, Xvid, DivX, MP4, WMV, MOV, MPEG, MPG, etc. with excellent quality for fun beyond web pages. Moreover, it can exact audio from FLV movies to hear music on PC, iPod, iPhone and portable playback devices. It gives you full control over video editing and output settings.